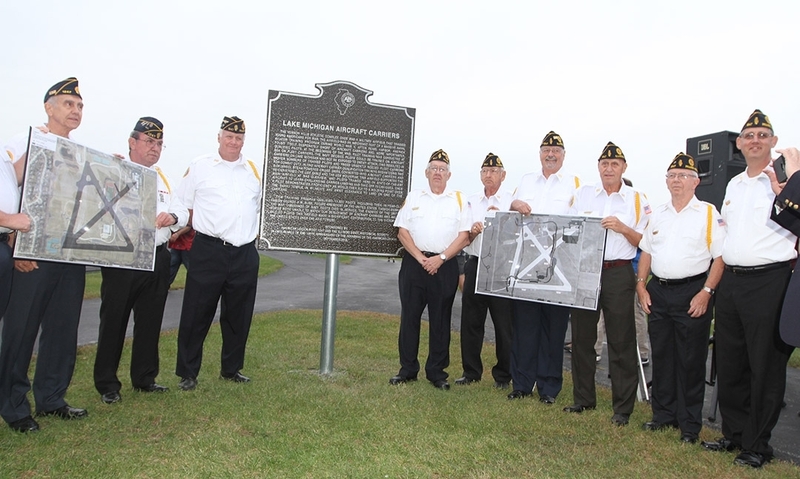 Post 1247 recently dedicated a Illinois historical marker as part of a project to celebrate the 100th anniversary of The American Legion. The post wanted to create a unique project that not only celebrated the Legion’s anniversary, but also respected the past sacrifices of veterans in war and let our community know its part in a unique story of our nation’s history. More importantly, Post 1247 wanted to bring this story to the young students of Vernon Hills so they would have a better appreciation of the sacrifices made on their behalf by Americans who came before them. The post chose a little-known historical event – namely, a Navy airfield located at Vernon Hills High School’s athletic fields that trained Navy pilots for aircraft-carrier qualification landings during World War II. The Illinois State Historical Society certified the project. Additionally the school administration of Vernon Hills High School and students warmly supported our efforts. The Village of Vernon Hills did the physical installation of the marker, which is 4 by 5 feet. It was a great project funded by our post, and was well-received by our community. Shortly after the dedication, the post color guard presented the colors for the national anthem at the Vernon Hills High School varsity football game. As mentioned, our project highlights a little known piece of World War II history regarding the training of Naval aviators to qualify to land on aircraft carries. The training program on Lake Michigan included two aircraft carriers, USS Wolverine and USS Sable. These ships were car ferries that were converted to aircraft carriers. The headquarters was as NAS Glenview and the main auxiliary field was at Vernon Hills. When the high school was built in the late ‘90s, the runways were torn up and state-of-the-art athletic fields took their place. This training program resulted in 17,820 pilots becoming aircraft-carrier qualified, and its graduates played a significant role in our victory over the Axis powers. Many a famous pilot trained, here including at the time the youngest pilot in the Navy, 18 -year-old George H.W. Bush, future president of the United States. The ground on where this airfield once stood now trains young Americans to become citizens of our nation, whereas 76 years ago it trained young Americans for war. The actual dedication ceremony took place on Sept. 7, 2018. The speakers included, Todd Renihan our post commander, the superintendent of High School District 128, the Illinois State Historical Society, the Navy chaplain from Naval Station Great Lakes, the mayor of Vernon Hills, and a member of Post 1247. The ceremony took place just outside the school’s football field, which is the site of the marker. The Illinois State Historical Society claims this was the largest crowd to have ever attended such a dedication ceremony. It was dedicated on a Friday night just before the varsity football game. At the unveiling of the marker the high school band played, “Anchors Aweigh,” a song they learned just for the occasion. All in all, from concept to the actual dedication, this project was a great success. As a result of the post’s efforts, we have witnessed an increase in participation and esprit de corps. New members have joined and we have gone on to plan other projects. Our standing in the community is well-respected, and the Legion is held in the highest regard. We encourage other posts to celebrate the 100th Anniversary in a way that will benefit the post, the Legion and their community.